-Most recent demo from this long standing Portugese raw and melodic Black Metal act. -A mandatory relic of esoteric, sumerian blessing chanted from within the 4 spheres. -Debut demo of this promissing Canadian act inspired by Forteresse, Drudkh, Branikald, etc. -Raw atmospheric Black Metal from Russia. -Official live split of two cult Polish hordes. -Amazing hateful Finnish Black Metal in the vein of old Darkthrone and Sargeist. -A recording unearthed from Sodomatic Slaughter's personal collection after being lost for the last 20 years. -Unearthed from the vault, one of the rarest entries in the Bestial Warlust canon. -Cavernous and chaotic Black/Death Metal on Putrescence Noire Records. -Great underground Polish Black/Death Metal, highly recommended! -Two demos on a single release of harsh Polish Black Metal hell for the devout! -Medieval witchcraft of Black Metal, second pressing of Under the Sign of Garazel. -Heathen Polsih black Metal on Putrid Cult. -The ghoulish masters of the crypt emerge from the grave with their heaviest and most morbid monument to date. -Original demo released under Demonion Productions. -Great occult Black Metal from Poland, recommended! -Majestic German Black Metal featuring members of Cryogenic. -Underground melancolic German Black Metal nicely packaged, highly recommended! -Seven songs of sharp, situalistic yet melodic Black Metal to honor the dead. -Melancholic and Epic Black Metal featuring Ash from Nargaroth on vocals. -Back in stock! Swedish depressive Black Metal negativism. -Unique and dark Funeral Doom Metal from Poland. -True pagan Black Metal from Denmark. -Old schoold Polish Black Metal with 80's influences, recommended! -Polish Black Metal extremists released by Mordgrimm Records. -Great hateful Black Metal on Putrescence Noire Records. -Second demo of furious Polish Death Metal musically feasting on veins of Brazilian classics of the genre. -A masterpiece from the second wave of 90's Black Metal, Hell's Headbangers remastered version... Mandatory! -Possessors of one of the most distinctive black metal sounds around, returns after a ominious, three-year slumber in the stygian depths with their highly anticipated fifth album. -Insane and rotten Black Metal from this Portuguese cult band. -Featuring interviews with Agalloch, Pest, Nuit Noire, Todesstoss and more. -Featuring interviews with Bone Awl, Kill, Thesyre, Necros Christos and more. -Featuring interviews with Forgotten Woods, Slidhr, Toil, Thralldom and more. -Featuring interviews with Alcest, Current 93, Arkha Sva, Ride ofr revenge, Primordial and more. -Featuring interviews with Ash Pool, Incantation, Trelldom, Arvet, Exorcism and more. -Featuring interviews with Fossbrenna Productions, The Ruins of Beverast, Celestial Bloodshed, Manes and more. -Featuring interviews with Black Majesty, Fleurety, In the Woods..., Coldworld and more. -Featuring interviews with Akitsa, Satanic Warmaster, Arckanum, Cripta Oculta, Vetala and more. -Featuring interviews with Anhedonist, Convent Guilt, Stench of Decay, Tribulation and more. -Their third masterpiece again with Thurios from Drudkh on vocals. -Death Metal legend from Italy. -Pessimistic Black Metal from Tasmania. -Debut demo of buzzing Portugese Black Metal horde. -Black Heavy Metal influenced by Black Metal's first wave. -Old school Black Metal from Italy. -Back in stock! Six tracks of frostbitten Polish raw Black Metal cult, highly recommended! -Both bands travel the previously selected path of mystical elegance, presenting the specific, magical atmosphere and darksome melodies, highly recommended! -Occult spiritualistic transcendental Black Metal from the United Kingdom, highly recommended! -Mordgrimm has re-released the classic debut album from the cult U.K. horde in a digipak format with new artwork. -Dark Teutonic ambient and Black Metal Art. -Melodic raw Black Metal from this elite act from the Basque Country in the vein of classic French bands. -Great Ambient Black Metal band from Slovakia. -A rabid blast of mean, ugly and vicious Black Punk Metal from Canada. -Polish old school underground Black Metal, nothing more and nothing less. -First untitled full-lengh consisting of six excellent and intruiging tracks spanning 37 minutes. -And it shall come to pass, that when they shall be hungry, they shall fret themselves, and curse their king and their God, and look upward. -Raw, profane, instinctive Black Metal. -Limited handnumbered edition featuring a 8 page artwork, dedicated to its owner. -Raw and atmospheric Black Metal, one of the few new bands that deserve attention. -Pure music from the mountains covered in fog, expect some mid-paced black metal with great melodies. -Cult Finnish black Metal demo featuring Nazgul a.k.a. Satanic Tyrant Werwolf. -Old school and primitive Polish Black Metal featuring a member of Immemorial Celtic Wind. -Slav launches an attack of pulverizing thrashing Black Metal while Daren works its traditional Black Metal art in the blood of the false! -An attempt to cast a new approach into so called Black Metal was made on this recording, unique and well done. -Raw and extreme Polish Black Metal on Putrid Cult. -Hypnotic and occult Black Metal featuring members of Goat Tyrant. -Serial Rawk n' Roll on Putrescence Noire Records. -Unique darkened occult Metal of Death that stays away from the usual "Metal Noir Québécois" standards. -Unapologetically raw and violent, bordering on a fury of blackened noise madness. Highly recommended! 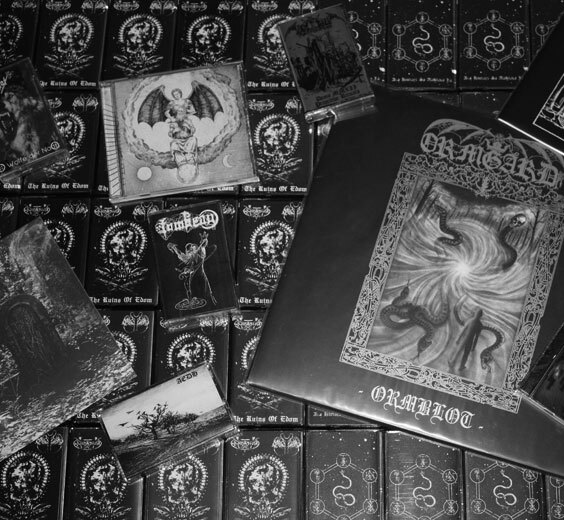 -Raw and underground Black Metal from Poland. -Atmospheric Black Metal from France/Russian Federation, include a sticker. -Back in stock! Obscure and evil Black Metal for the old school worshippers. -The cult classic album originally released on Roadrunner Records in 1984 now issued under Hells Headbangers with the full cover artwork and album lyrics. -Raw tracks from the early days of the band, a compilation of all old demos, split tracks and unreleased stuff. -Debut LP of this cult horde which exceeds all expectations in terms of music and artwork.